Butterflies offer us a special glimpse into nature's constant rebirth. In many cultures the butterfly is symbolic for rebirth and creativity. Young minds find the process a mystery, but how the butterfly changes from a caterpillar to a chrysalis to a beautiful winged creature isn't magic, it's science! 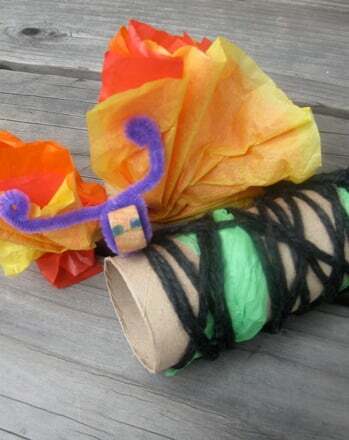 This arts and crafts activity is all about caterpillars emerging from their cocoons as butterflies. Take a piece of tissue paper and fold it up accordion style. Slide the folded paper to the end of the legs of the clothes pin. Glue it into your clothes pin to make a butterfly. Spread glue along the toilet paper roll. Wrap yarn around the roll in tight circles until it is completely covered. Leave one end open. Now you have a chrysalis for your butterfly to emerge from. Once your chrysalis and butterfly are dried, have your child tie a length of yard around the body of the butterfly. Tuck it into the cocoon, and gently pull the string to recreate the special moment when the butterfly emerges. Butterflies vary in how long they remain in their chrysalis stage. When butterflies first emerge from their cocoon they must wait until their wings dry before they can fly. It can take 1 – 3 hours, in which time they are extremely vulnerable to predators. Butterflies eat nectar from flowers and carry pollen with them from plant to plant making them important pollinators. 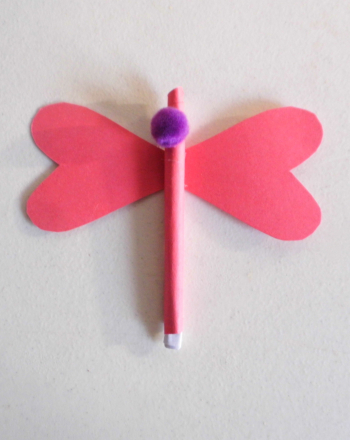 Help your kid celebrate Valentine's Day and keep up with her homework with this butterfly pencil craft! This fun Valentine's Day craft is perfect for your little sweethearts. Just cut out the colorful butterfly and add a lollipop for the head! Try coloring a unique pattern on the wings of each butterfly in this butterfly mandala. 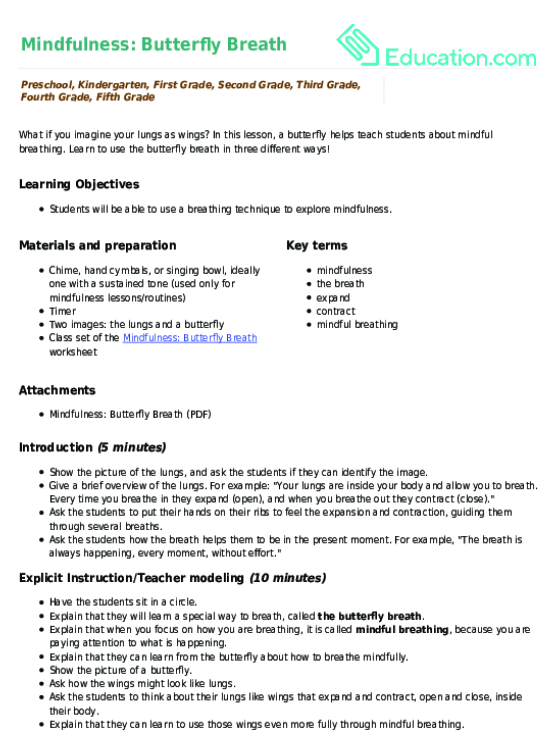 In this lesson, a butterfly helps teach students about mindful breathing. Learn to use the butterfly breath in three different ways! Give your child a great coloring page full of fun flower facts! This one is about the iris flower and the butterfly. Help your child's creativity take flight as she makes her very own butterfly life cycle. There's a beautiful butterfly to behold when your budding artist learns to draw. This worksheet teaches that basic shapes can make drawing simple. This sweet butterfly is missing her wings! Help finish this picture by connecting the dots and skip-counting by five. Make a Butterfly Pie Chart! How long does a butterfly live? Find out with this worksheet! Give your second grader a fun way to practise making graphs using given information. Children draw inspiration from the butterfly as they practise mindful breathing, then design a mindful breathing technique of their own.